The USRP RIO software defined radio (SDR) features an integrated 2×2 MIMO transceiver and a high-performance Xilinx Kintex-7 FPGA, all contained in a half-width 1U rack-mountable enclosure, to accelerate baseband processing. It connects to a host controller through a cabled PCI Express x4 connection to the system controller to allow up to 800 MB/s of streaming data transfer to the desktop or PXI Express host computer (or laptop at 200 MB/s over ExpressCard). Figure 1 shows a block diagram overview of the USRP RIO hardware. The system also features PXIe-7976R FlexRIO FPGA coprocessor modules to address the real-time signal processing requirements for the MIMO Prototyping System. Each PXIe-7976R features a powerful Kintex-7 410T FPGA. Each FlexRIO module can receive or transmit data across the backplane to each other and to all the USRP RIO SDRs with <5 Âµs of latency and up to 3.2 GB/s throughput per FPGA coprocessor. The number of FlexRIO FPGA coprocessors required scales from one to four based on the number of antennas used. In MU-MIMO, a base station with many antennas communicates with several single antenna User Equipment (UE). The MIMO Application Framework supports up to 1 single antenna UEs.Â Each UE represents a handset or other wireless device. UEs can be represented by using an individual USRP RIO with an internal GPS-disciplined oscillator (GPSDO) connected to a laptop through cabled PCI Express to ExpressCard connection. The GPSDO is important because it provides improved frequency accuracy plus additional synchronization and geo-location capability. A typical MU-MIMO testbed implementation will include multiple USRP RIOs acting independently as UEs. Since each USRP RIO has two RF channels, each USRP and laptop combination can represent two UEs. 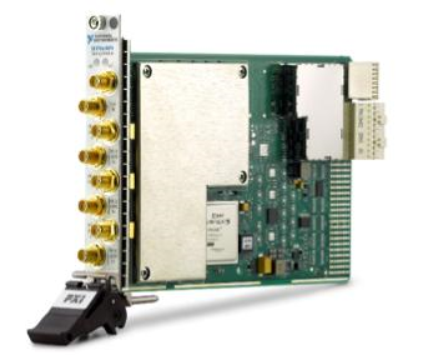 For UEs with more than 1 antenna, the required hardware is identical to that of the base station.Â That is, in addition to the USRP RIO, a PXI chassis, controller, FlexRIO FPGA modules, PXIe-6674T timing and synchronization module, CDA-2990 reference & PPS distribution module, and CPS-8910 PCIe switch box module are also required. The MIMO Application Framework is implemented in LabVIEW Communications, and supports ready-to-run FPGA IP for MMSE, MRC, and ZF beamforming. The Application Framework also offers over-the-air synchronization, channel reciprocity calibration, a reconfigurable frame structure, MIMO detection, precoding, and real-time communication. Read theÂ MIMO Application Framework white paperÂ for more information.